Ti Jonas is a water source in the southwest coast of La Tortue, situated high in the islands slopes, far from the beaches below. From the nearest village, Nan Gri Gri, it is a steep three-quarter mile hike with very little tree cover. The trek is best made in the early morning, or late afternoon, to avoid making the climb in the blazing sun. The path is rocky and rough, created by small drainage streams during heavy rain, rather than feet or hoofs. One can easily slip, and the hillside seems to slope mercilessly into the sea, about a mile below. Once you arrive, however, you are rewarded with ample shade provided by the tall trees that surround the water source. The water source itself is essentially an artesian spring encased in concrete masonry. The water is fresh, and essentially clean–people and the environment (through storm run-off, and the like) pollute the water. Once settled it looks clear, and to many locals is considered “clean”. However our tests revealed that the water is contaminated with coliform bacteria, which can prove hazardous to one’s health, and render the water below the standard we deem drinkable in the developed world. 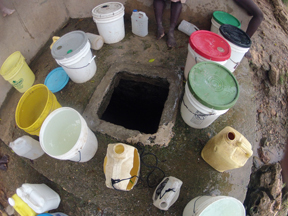 A main source of this contamination are the containers used to gather and transport the water, which are dipped directly into the source, and are usually very dirty. A big part of any solution here is going to be to eliminate contact between these buckets and containers, and the water source itself. Ti Jonas, Before. Crumbling and contaminated. 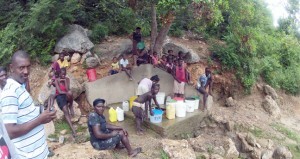 When we arrived to survey the site, there was already a large group of at least 20 people at the site using the well. A dozen or so empty plastic containers that once held anti-freeze and detergent were dipped into the water via a worn square opening in the concrete, suspended (sometimes) by a thin rope. Over and over again this container would be filled and emptied, being used to fill other nearby containers. People nearby were washing clothes, and some were bathing.We took stock of the area, noting the high elevation, the lack of accessibility, and the young age of many of the users. We also noticed two smaller “water-holes”, one on either side of the cement well. These were murky, and obvious breeding pools for mosquitoes. The well is a busy place. During a brief huddle we quickly decided we wanted to expand the development to include the two smaller water-holes, and that we wanted to completely demolish and rebuild the entire well. The main point of discussion was the pump. Would it be safe all the way up here, with no one living nearby, so off the beaten path? Who would make sure it was being used properly, and not broken by misuse? Would we consider hiring someone to “guard” the pump? How would we transport the pump all the way up here? The more we thought about putting a pump here, the more questions and concerns mounted up. Carl presented a creative solution to the problems: What if we had no pump at all? 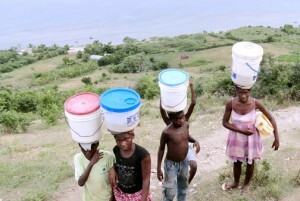 What if, instead of hiking all the way up here to pump their water, what if the water were gathered up here, and piped down the hill, to a spot near the village? By installing a faucet spigot, water would be accessed without the user’s container coming into contact with the water source. This would eliminate a major source of contamination. Users would no longer need to make a long, and potentially hazardous hike to get access water. By making this water more readily available, the user would have more time to perform other tasks. The water source itself would become less relevant, and could be secured and maintained by a trained group of people within the community, with less controversy. These people would perform routine maintenance on the well to ensure the water’s quality, the source would be otherwise closed to the public. The solution could be expanded on in the future to supply running water to homes in the area. We all liked the idea, but what would the community think? We decided to plan a meeting with Tet Ansam, a local organization situated primarily in Nan Gri Gri (The community directly below Ti Jonas) for the following day.